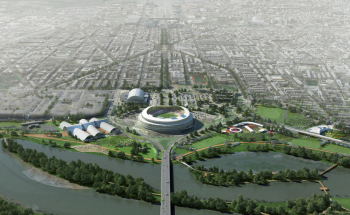 The Robert F. Kennedy (RFK) Stadium Quarterly Community Stakeholders Meeting took place Monday, July 10 at 7 p.m at RFK Stadium (2400 East Capitol St. SE). Gregory A. O’Dell, the President and Chief Executive Officer of Events DC, provided an update on the RFK Stadium Campus redevelopment plans. The meeting focused on the proposed recreational fields, which are the first elements in the short-term plan that are expected to be completed. The fields are projected to be built in the next two years. O’Dell said that Events DC had hired a lobbyist to help Events DC keep control over the site, in part to create a larger window to finance development. The current lease expires in 2038. O’Dell said there were two ways to maintain site control. The first is an extension of the lease. O’Dell said a 30 year extension was typical but that Events DC would seek a 50 year extension. The second is to seek a transfer of ownership, or “fee simple title,” which he said would be more difficult. ANC Commissioner Denise Krepp (6B10) asked who would be doing the lobbying and how they would be paid. O’Dell announced that Squire Patton Boggs had been retained to lobby Congress for the contract extension, and would be paid directly by Events DC. He said Events DC would update the community on the message the lobbyists would be conveying at the next redevelopment update meeting, which he said would be scheduled for September. Three different plans for the fields were presented by Bill Mykins, of Brailsford & Dunlavey, the Program Management Firm working with Events DC. He said that although the plans were still in flux, currently all call for three or four fields with flexible uses, including lacrosse, soccer and little-league baseball. The fields would be artificial turf, which he said has more longevity and better drainage. Community members focused on issues of transportation, with one noting that a road along the east side of the present stadium site dividing the campus from the Anacostia River was likely to face tremendous community opposition. Residents inquired about additional Metro stations near the site. O’Dell noted that Events DC has been in communication with Metro but that at this time Metro was focused on other, more immediate issues and that the topic might be confronted later in the planning process. The next Quarterly Stakeholders Meeting takes place October 16, 2017 at RFK Stadium.